Traditional golf instruction tells you to peer straight out at your target and then align yourself with it. Well, it may surprise you that when I set up for a shot I sometimes don't even look at the flag. Instead, I look above and below. Above, to the highest point on the horizon, be it a tree top, a mountain top or a guy in a red hat standing in the gallery behind the green. Remember, not every shot is played directly at the flag, and it's a good idea to find something that will hold your concentration. Just as important, I find it easier to fix my eyes and mind on specific objects. After all, every flag looks the same. Then I go below, and seek out an area of the turf just in front of me - a leaf, a discoloured area of grass, a divot -- that is directly in line with my earlier, lofty aim spot. 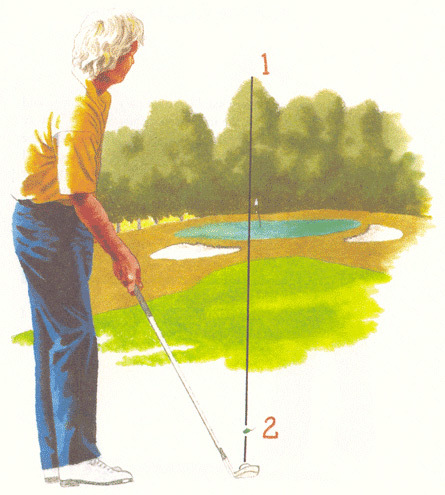 This is a technique I learned directly from a Jack Nicklaus instruction book, and of all the things I've tried to emulate from Jack, it may be the most important. To this day, I can think of no player who consistently aligned himself more accurately than Nicklaus.